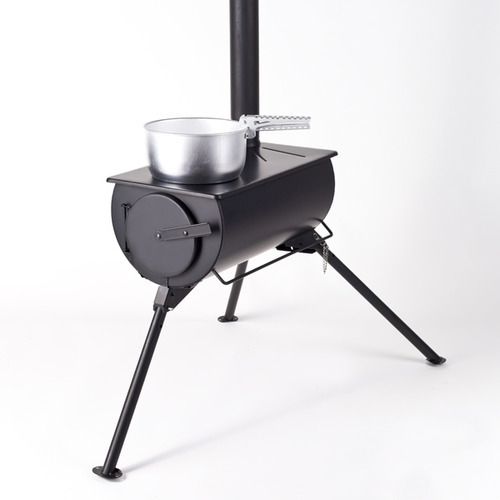 The Frontier Stove is a multi fuel stove which can be used both for heating and cooking. This highly portable stove has an output of 2-2.5kw of heat and comes complete with 5 sections of flue. Perfect for any outdoors activity where heat and something to cook on is required. People use them in the privacy of their back garden, at picnics and especially useful for camping and boating trips. Accessories include flashing kits to enable the stove to be used in sheds/ cabins and cotton tents. This is an impressive piece of kit to use in situations where open fires are not practical and in most camping sites, not permitted. The Frontier Stove provides sufficient heat with something to cook on as well as the possibility of providing hot water on tap. The stainless steel “Water Boiler with Tap” will be a great addition to the accessory range for those who would like a supply of hot water for tea, coffee and soups! This will be available from May 2012.